Contra Dancing is our most popular activity, featuring live traditional music performed by local bands. Contra Dancing is an energetic enjoyable activity that promotes healthy life stlye, and provides an excellent opportunity to socialize and meet new friends. We dabble in some square dances too. Because most of our activities are organized and staffed by enthusiastic volunteers, we do our best to keep event costs down. 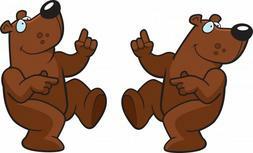 Explore this website to learn more about Dancing Bears, our organization, and the activities we sponsor. Plan to attend an event soon and join in the fun! Plus -- We offer GREAT discount admission prices to first time dancers, and to Students. Attend a dance and See Why! Most Contra Dances are held at Wendler Middle School or Romig MS in Anchorage Friday at 7:30. Plus, there's even more fun in The Valley! Check out the Palmer Dance Schedule. All of our dances are listed on the Events Calendar link. The foremost event of the year, is Dance Camp, held each Memorial Day weekend, at Kings Lake near Wasilla. See our events & calendar page. The Bear Phone 907-566-2327 (BEAR) also provides the latest information on events and sometimes location changes. Kind of like square dancing in a line. We don't require you to attend lessons or wear special costumes. Learn just by coming to your first dance, but come early. The first dances of the evening are the easiest! For other great dance opportunities, check the Other Groups link for more informantion. Please read Listserver Policy on the Policies page.